Buddy's getting restless. He's been crated in the back of the car for two hours and that's a long time for a dog to be cooped up; but where can you stop to get him some exercise? Thanks to a new iPhone application, you won't have to worry about your dog's exercise needs when you're on the road. Eukanuba has just released the OFF LEASH dog park locator and it's free! The OFF LEASH application finds nearby dog parks for you, wherever you are. 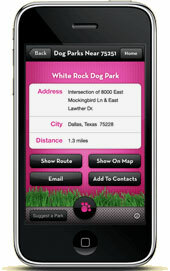 iPhone and iPod Touch users can just click the "Locate Me" feature and then, in the Eukanuba application, hit the "Dog Park Locator" and the five closest OFF LEASH areas will pop up on your screen. When you pick one, driving directions from where you are to the dog park will appear. petcare.im@pg.com, if you don't find them in the current database. Eukanuba TV is another feature of the OFF LEASH application, featuring cute videos, training tips, breed information, and other stuff dog lovers love. Download the 2.7MB OFF LEASH app at the iTunes Store, or visit Eukanuba.com for more information.